How Do I Easily Edit My Website Pages Online? 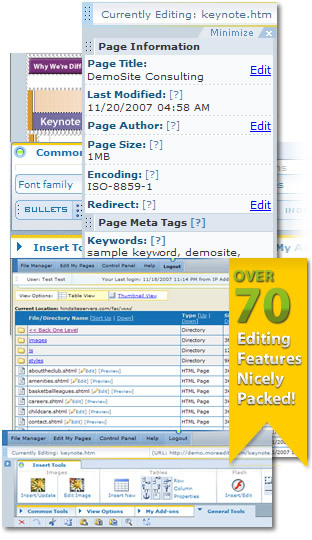 Web site editing answers for editing your website Pages without depending on someone else to edit it for you. Want to be able to edit website from ANY computer , where ever you are? Your web site is typically composed of many lines of source which together along with assests (such as images/graphics) are rendered by a web browser into a graphical format that is visible to you and your end uers. A). WEB DESIGN SOFTWARE: You can rely on web site design software such as Adobe Dreamweaver (formerly Macromedia), Adobe GoLive , or Microsoft FrontPage. Pros: If you are highly knowledgeable in HTML coding and familiar with such software, they provide a high degree of flexibility and for such users they are a must have if you are a web designer / Developer. B). A WEB DESIGN PROFESSIONAL: You can have a web design professional do the updates for you. Pros: You have your content updated by a web professional who may have a good grasp of HTML coding and can do more than simple content updates. 3). RECOMMENDED: DO IT YOURSELF WEB SITE EDITING SERVICE: Use a web site editing "Do it yourself" service to make content updates to your web page(s) with a good HTML Editor. You can learn more from this great article: How can I edit my website? Use HTML Editor Online Editing tool. Pros: Saves time, money and the hassle of depending on someone else to do the web site updates for you. Online editing services can allow you to quickly connect to your web site from any computer and virtually eliminate the needs for a web professional to make common content updates for you. This in turn can save site owners timeand money (typically costing $10-$30/month) and increase efficiency. Cons: Web Site Editing services are as their name implies for editing an existing web site. In other words they are not designed to create a web site from scratch but edit an existing one. 4).CONTENT MANAGEMENT SYSTEM (CMS): Use a content management system to make updates to your web site pages. Pros: When properly installed, it saves time, money and the hassle of depending on someone else to do the web site updates for you. Content Management Systems also work from a site template therefore minimizing your ability to affect the structure of your web site layout. Cons: In general Content Managements Systems can be costly for the small to medium sized web site; It requires a professional web developer to manually install the software to your web hosting account and integrate it within your web site and on average the installation can cost anywhere from a low end of $500.00 to as much as $10,000.00. Note: Even though open source and so called "Free" Contement Management tools such as Mambo are available, they will still require installation to your web site; Lastly if you ever redesign your web site interface, it will more than likely require re-installation of the CMS systems to your web site and acquire additional expenses. Want to be able to do it from ANY computer , where ever you are?